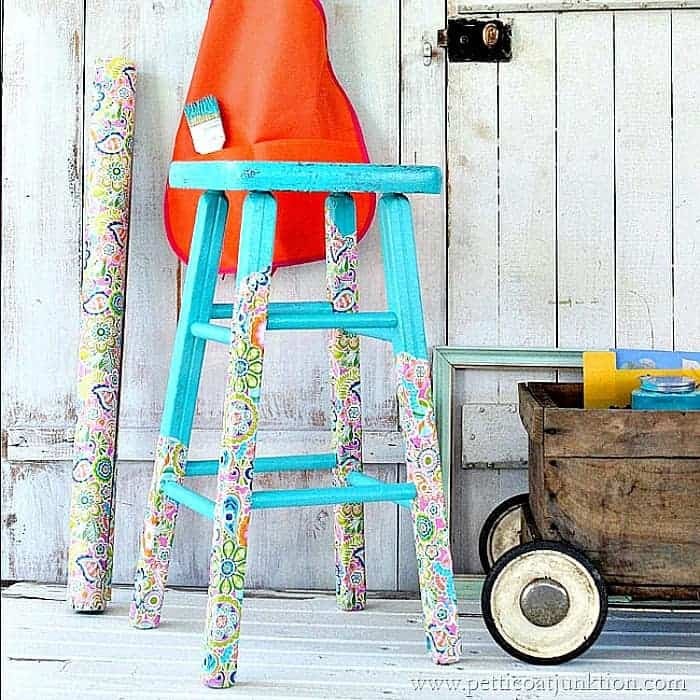 Did you know you can decoupage furniture using wrapping paper? 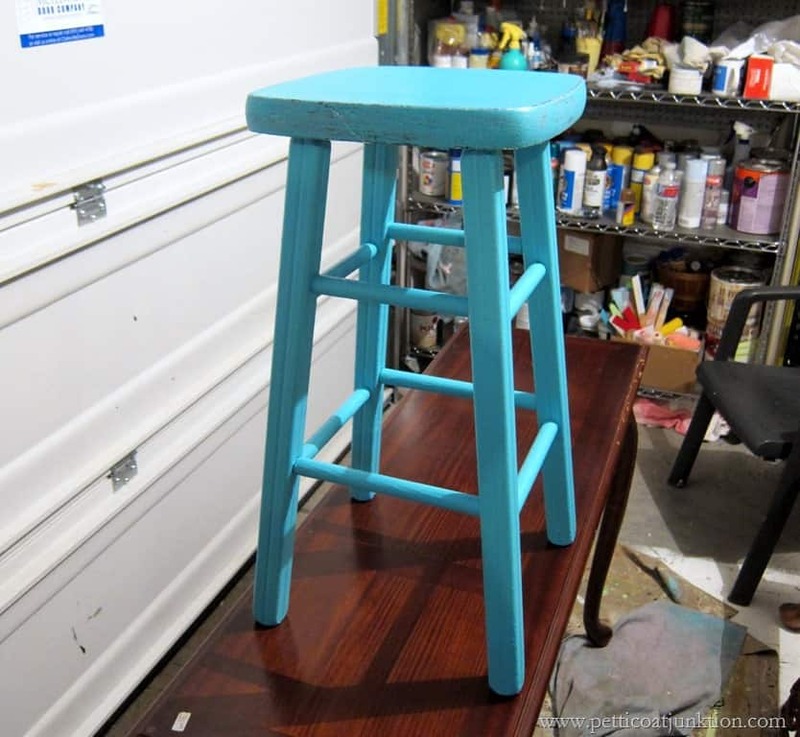 I painted a stool turquoise and wrapped the legs in paper using Mod Podge. I jumped on the dipped furniture leg craze…kind-of…. I’m showing off my legs with paper not paint. This stool has been sitting on my fireplace hearth holding magazines and a Ball jar full of seashells. It was part of my Summer décor. Now Summer is almost over and the stool is getting an update. I found the stool at My Favorite Junk Shop and I really liked the paint job….really!I like the way the white and black paint are uneven on the legs. That’s where I came up with the idea for the decoupage legs. The roll of wrapping paper came from Hobby Lobby. 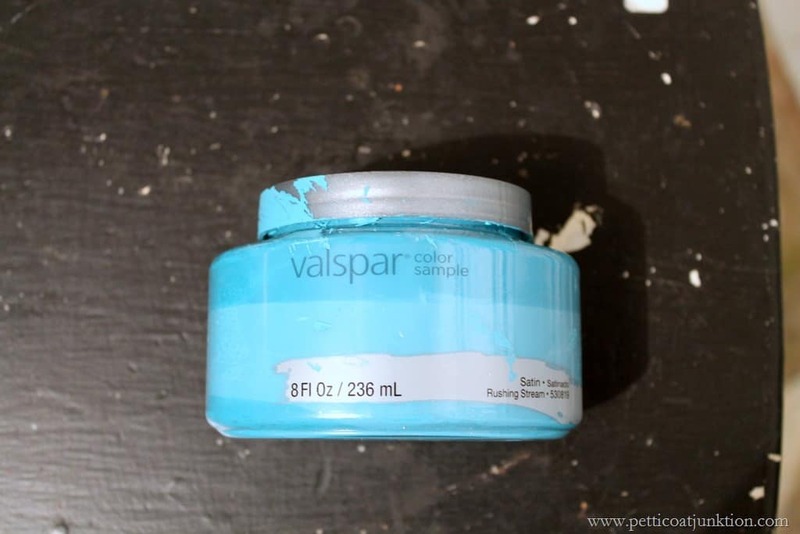 The Valspar paint sample in Rushing Stream was the pick for this project. Such a fun color. The original paint looked like it was oil base so I applied a coat of Glidden Gripper Primer to start the project. Ready for the new legs. 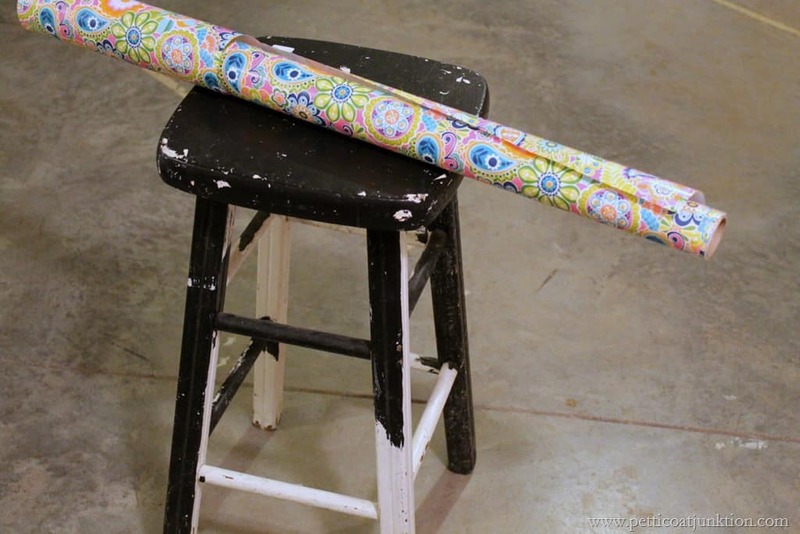 I cut strips of wrapping paper and applied Mod Podge to them with a brush. It was a little difficult to paper around all those rungs. Actually it drove me nuts. I cut angles around the rungs then wrapped the paper around the legs. They don’t call it wrapping paper for nothing I filled in spots where the paint was exposed…where I didn’t want it to be….good thing the paper is a really busy print. 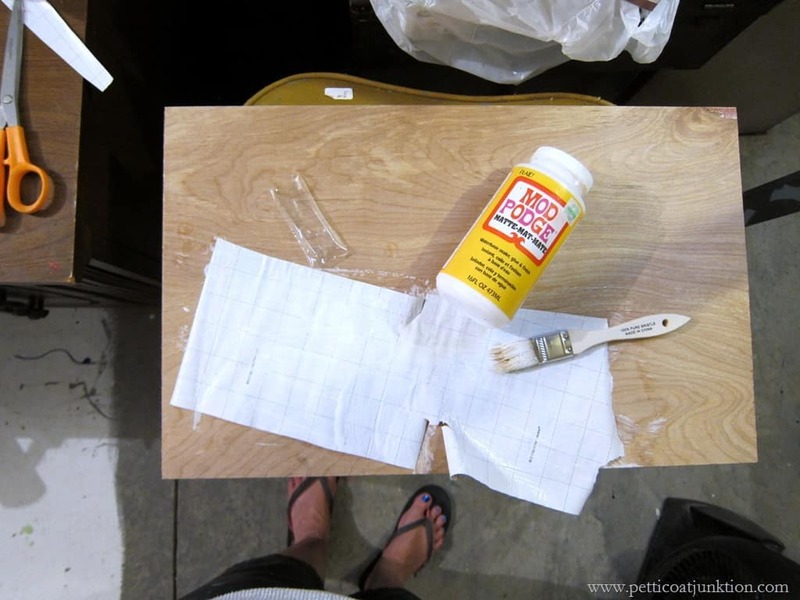 I let the Mod Podge dry then used spray on clear Polyacrylic as a sealer. 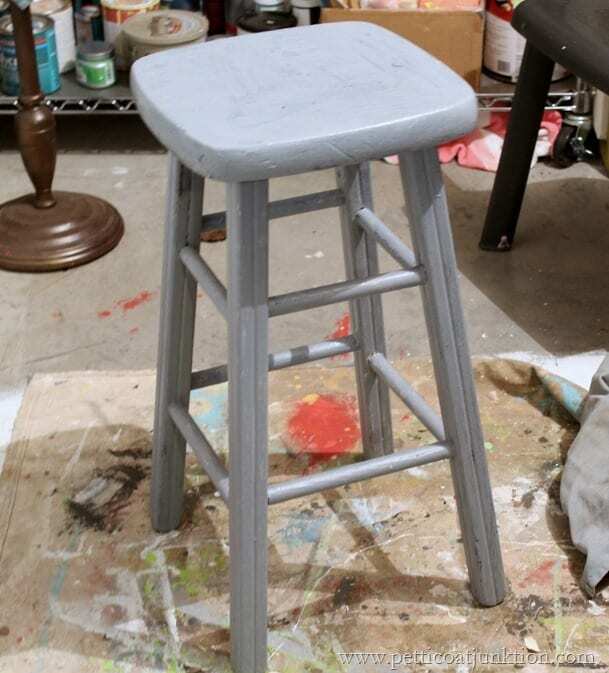 I distressed the seat so the black paint would show through. I think it works because of the dark blue in the paper. Want to see more Mod Podge projects? 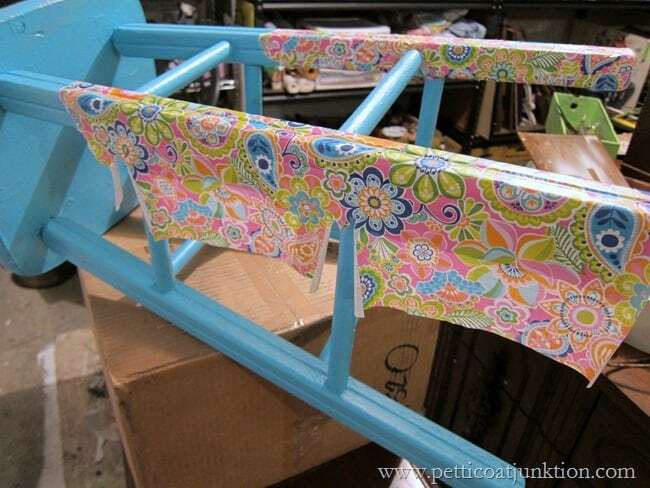 Click here…..101 Unique & Amazing Mod Podge Uses. That’s it. What do you think? Ok….I love it! Oh wait, I was asking you! Have a great day. WOW your stool is absolutely GORGEOUS! You did an amazing job! Visiting from TT&J link up. I LOVE this take on the dipped legs such a fun bright print! super cute! Thank you! Come back again! 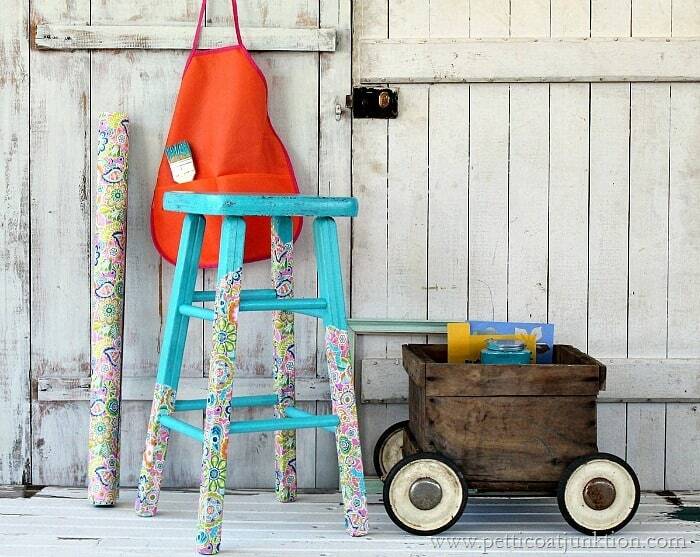 What a great idea-love your stool. With school and working on projects, where do you find time to do anything else, let alone polish your cute little tootsies with blue polish? How is school doing? What does your hubs do while you’re at school? Hope he’s taking good care of himself. 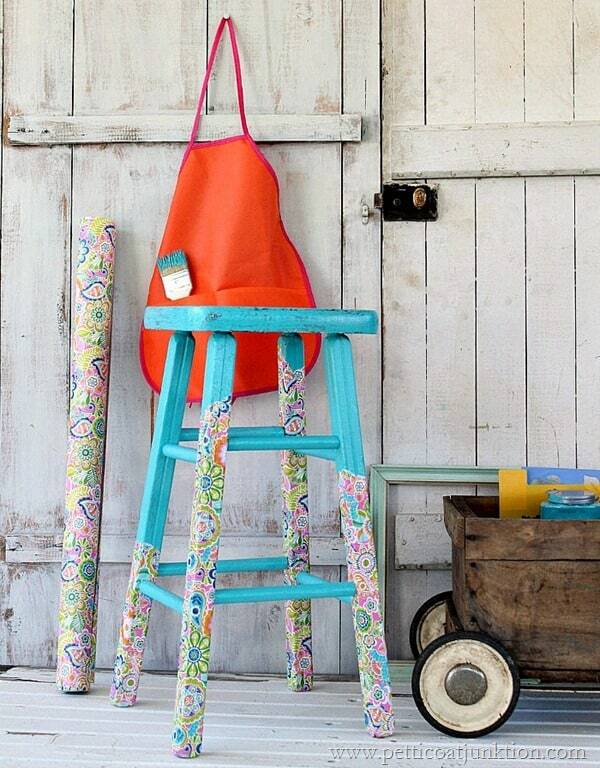 Love your stool, you just might start a new trend. I’ve got 4stools out in yard waiting to be rescued. Someday. every DAY I look forward to reading what project you are working on….you are so talented! Been buying up furniture pieces to work on when I finally get to retire…and now I wish I could just retire earlier! you are such an inspiration. Thanks. 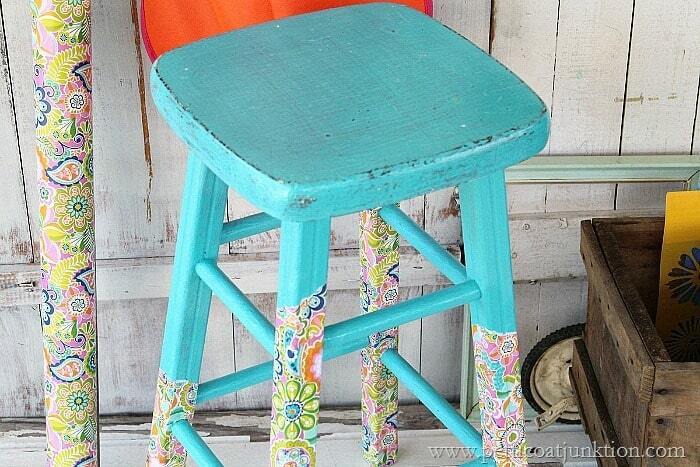 LOVE what you did with the stool, gives it a really fresh, updated look! It still has a rustic feel with the aging though and just love the finished project!!! I love the way your stool looks. You are so creative. How fun! What a neat idea! So in love with your stool redo Kathy! 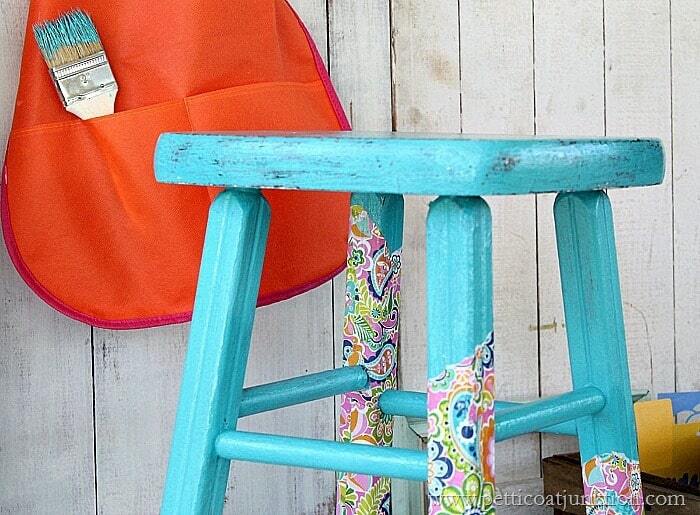 The color & that fun pattern is right up my alley! I’m not very fond of dipped legs but I LOVE what you did with the paper. Now I’m looking around for something I can do with paper. Thanks for the idea. I have now an idea of what to to do with my boring stool! thanks!! !